In the fast-paced, ever-changing world of today, Singapore’s workers need to constantly upgrade themselves in order to stay ahead of the curve and push the economic frontiers of the nation. Together the SkillsFuture Singapore (SSG) and Workforce Singapore (WSG) ensure the continuous training and transformation of the local workforce and industry. WSG helps workers remain relevant, so as to meet their career aspirations by promoting development, competitiveness and employability. This is complimented by SSG, who helms the national SkillsFuture movement and promotes a culture of lifelong learning. The SSG-WSG scholarship is a joint initiative between both organisations that exposes young talents passionate about creating a competitive workforce, to development across both agencies. 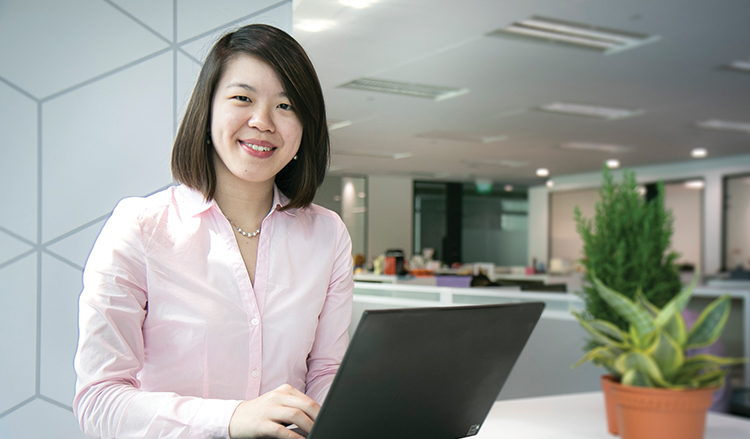 Scholar Lee Yue Kai, 27, tells us how this scholarship has enabled her to play a role in shaping our workforce and skills for the future. What attracted you to the SSG-WSG scholarship? Lee Yue Kai: Keeping my skills relevant and constant upgrading have always been priorities for me. It was thus a good alignment between my personal aspirations and SSG and WSG’s focus. SSG focuses on driving the national SkillsFuture movement, promoting lifelong learning and skills mastery, and strengthening Singapore’s ecosystem of education and training. As I strongly believe in the importance of skills in helping one stay relevant in the changing world, SSG’s work keeps me engaged and fulfilled. I also look forward to how SSG and WSG can cooperate closely on providing the necessary support for the jobs-skills ecosystem. Tell us more about your job. What memorable moments have you had? Yue Kai: As part of a policy team within SSG supporting SkillsFuture, I am involved in meetings at many levels and get to hear the discussions and opinions of many stakeholders, including political office holders. My team had conceptualised and implemented two SkillsFuture awards (SkillsFuture Fellowships and SkillsFuture Employer Awards), which involved the development of policy parameters and implementation processes, in consultation with tripartite partners. I also had an opportunity to work with MOE colleagues and the Swiss Embassy to conceptualise a Switzerland-Singapore Business Forum for SkillsFuture to reinforce Switzerland-Singapore ties and promote SkillsFuture on a national platform. The event was graced by the President of Switzerland and DPM Tharman. It was a unique experience working with people from different backgrounds and cultures to put together a successful event. How has the SSG-WSG scholarship benefitted you? Yue Kai: As part of the planned postings for scholars, I had the opportunity to be exposed to both industry engagement and policy work at the early stages of my career. This has helped to develop me holistically. Through this, I had a better understanding of how our policies have impacted the workforce. What can aspiring scholars look forward to with a career at SSG or WSG? Yue Kai: You can look forward to a vibrant learning culture supported by various learning and developmental initiatives to help you progress and grow. Depending on your interest, you will get the opportunity to experience cross-agency or divisional projects, overseas study trips, as well as postings and secondments. You can also seek advice on your career development and growth from experienced senior leaders, through our mentoring programme. Have you always been intrigued with aviation? Find out how you can soar above and beyond with CAAS.